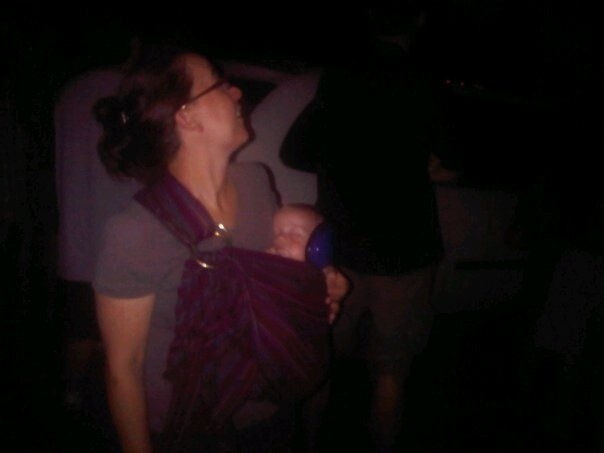 This is my 32nd installment of Babywearing Stories 365. Each installment features a babywearer in 1 photograph and their answers to 5 questions. 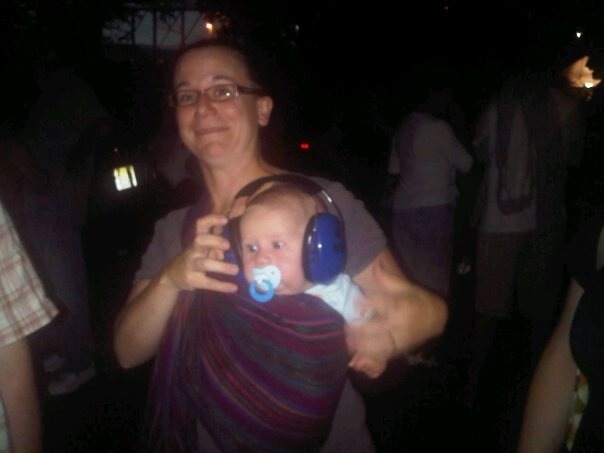 My goal is to normalize, promote and celebrate daily Babywearing, moving beyond *what* we use to carry our babies and shifting focus back on *why* and *where* we carry. I hope to share the stories of moms, dads, and babywearing caregivers all over the world. Enjoy! It took my husband and I a good deal of time to decide whether or not we wanted to be parents. When we finally made the jump, we found (to our utter delight) that life wasn’t really all that different! We are blessed with great friends who are as happy to have our children around, no matter what the occasion, as they were happy to have just us around before we became parents. These pictures were taken in the summer of 2011 when our son was about 6 months old. Lambertville, NJ had just begun a new summer tradition of Firework Fridays and it was a booming success. Tons of people out and about on a gorgeous night, lots of shops open late, restaurants serving special dinners, people milling and chatting everywhere — it was the very best kind of community event. A group of us decided to go, and, I admit, I had a lot of new parent misgivings. Was it too late to have the baby up? Would he be scared of the noise? Would there be too many people? Should we bring the stroller so he could sleep? Was it rude to hog so much sidewalk space? And after all the teeth gnashing we just said, eh, screw it. Take the sling and call it good. If the whole thing is a train wreck we’ll just cut out early and go home. Well, it was loud and raucous and a ton of fun and he was out like a light before the fireworks even began and never woke up once. I love these pictures because that night, for me, taught me that you can do absolutely anything with a baby if you have the right attitude. Two years and another baby later, we’re still doing all the fun stuff we used to do and are (I hope) better friends are parents because of it.